Due to the snowstorm, the celebration of the Nativity Feast will be postponed till the next Sun Jan 27 at 1:00 PM in 60th Place Church. 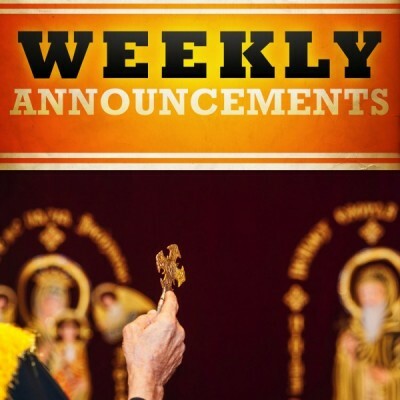 • Also there will be no meetings tonight in both Churches, and no Divine Liturgy for the feast of Cana Galilee. Mon Jan 21 is the feast of Cana Galilee, on of the minor feasts, and the feast of St Demiana. There will be a Divine Liturgy 9:00-11:00 in Woodward Ave Church. Our Recreational and Spiritual day for elementary school students and the family meeting will be on Sat Jan 26 at 60th Place Church. It will start at 12:00-4:00 PM. Alhan classes will be at 4:30 PM. The family meeting will start at 5:00 pm. Light for Orphans is hosting the Super Bowl at Dave and Buster on Feb 3. You can pay online or the tickets will be with Mrs. Nancy Ashamalla.